KiCKASS WiTCH : Putting The "K" In Magick: KickAss Depression Cure : Take Your M.E.D.S. KickAss Depression Cure : Take Your M.E.D.S. This is a post that I did last spring for CoCreatingOurReality.com aka CCOR, which is the community that first got me making YouTube videos and talking publicly about my personal journey & spiritual beliefs. I am no longer a member there, but I highly recommend it to anyone looking for a place to bond with people who are enthusiastic about the Law Of Attraction. To anyone suffering from depression or lethargy... I've been there. And- there was a time when I thought that I would always be there. It was quite the journey pulling myself up & out into the world, and I would LOVE to be of service to anyone struggling on a similar path. I am not a doctor, so this is not an official medical recommendation. It is my personal opinion and a bit of heart-felt, enthusiastic advice to... TAKE YOUR M.E.D.S. Much is written about the benefits of meditation. It reduces muscle tension, slows the aging process, relaxes the nervous system, improves one's mood & literally restructures the brain. There are many excellent guided meditations available on disc, mp3 or even on YouTube, and, if you haven't tried meditation, this might be a great place to start. However, I would like to suggest taking up a regular, daily practice of still, silent meditation. It is then that the real benefits of meditation begin to emerge & the comfort inherent in routine solidifies, as well as the creation of new neural pathways. I don't remember from where I lifted it, but I live by the acronym, RPM, which stands for "Rise. Pee. Meditate." I like my spirituality with a dose of humor, and morning meditation is a beautiful way to set the tone for the rest of your day. I'd also like to add that there is no need to completely silence your mind for the entire length of your meditation- that is merely a goal & NOT worth quitting or beating yourself up. 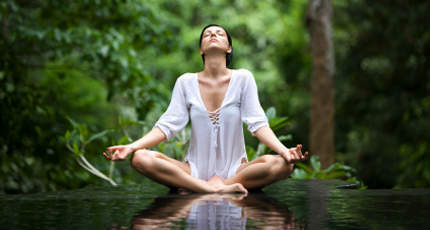 Just start with a few minutes to sit quietly and focus on your breath, letting your thoughts rise & fall as they want to. It can help to send particularly sticky thoughts some love and then imagine them floating away in a bubble. Don't just lay there. Move. Wiggle your toes. Stretch. Get vertical. This step is critical when it comes to feeling lethargic, like your veins are filled with lead & you're too apathetic to even rise from the couch to fetch the remote control. Pretty soon your walk will turn into a march and your march will turn into a bounce. You may even find yourself smiling. MUSIC can help speed this along. At that point, I recommend old school jumping jacks to get the blood, oxygen and lymph moving. Ten minutes of this can feel like coming back from the dead. And, once you get going, you probably won't want to stop. The same principle applies to throwing on a pair of sneakers & taking a walk around the block or doing some light yoga, dancing, shooting hoops, etc. Anything that you enjoyed doing as a kid will work wonders. Remember: ENERGY BEGETS ENERGY!!! Tell yourself that often. So much has been said about nutrition & the countless conflicting opinions, that I am not going to press any more dogma on you here. I will say though that many people claim to have cured themselves of chronic depression, diabetes, heart disease, even cancer, using a raw food diet, so, whatever dietary path you choose (Ayerveda, Macrobiotics, Veganism, etc) try working more fresh, organic fruits & especially GREEN veggies into your diet. We all know that drinking soda & eating junk food is going to do you no favors, but, instead of worrying & feeling guilty about what you need to cut out, it can be helpful to focus on ADDING in to your diet things like salads, green smoothies, and fresh fruit. That way you can try new foods without feeling deprived, while filling up on healthy choices before reaching for the old standbys. Who knows- you may even find that you prefer celery & hummus to chips & dip. Stranger things have happened! TIP: if you have a juicer, try juicing 2 large cucumbers, 3 apples & 2 lemons for a YUMMY, super energizing alternative to lemonade. It's one of the most palatable "green juices" that I've tried & the one that I make for juicing-newcomers & naysayers. RECOMMENDED READING: Julie Ross MD's "The Mood Cure" or "The Diet Cure". I have both and they were absolutely instrumental in helping me over come years of recurring depression (as well as alleviating MANY of the symptoms of my son's autism). I'd been on a path to find a cure for over a decade when I found these books & can not over-emphasize the quantum leap I made on that journey because of Julia Ross MD. The amino acids she recommends are lifesavers. For example, taking 5htp before bed will not only help you get a good night's sleep, it will also raise the levels of serotonin in your brain. Also- taking GABBA (on an empty stomach) will ease a rash of irritability in less than 15 minutes. DLPA & Tyrosine are energizing and L-Glutamine is incredible for getting rid of sugar cravings. I hope that you have some excellent friends &/or compassionate family members that can do this for you in your "real" life. If not, that would be an excellent thing to focus on creating for yourself. Books can be a wonderful form of support, too, and, let's not forget God (Goddess, Your Spirit Guides, the Universe, however you call on source energy). Ask for help. It's there when you need it. Practicing self-love is also a form of support, maybe the most important. So, find a loving affirmation that really resonates with you & repeat it all throughout your day. One of my favorites is, "I love & approve of myself exactly as I am." If you're new to affirmations, Louise Hay's "You Can Heal Your Life" would make a lovely introduction to this powerful tool. Thanks Joanna! Im really connecting with the simplicity of these tools and guidance. I feel, the simpler, the more powerful. Im always telling my clients this. THANKS for the friendly support, Nicole!